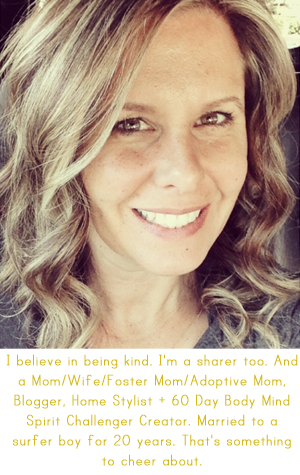 April Kennedy...My Life + My Style: Fostering Love...not just to the babies. Fostering Love...not just to the babies. today should be an outfit post. than what I am going to wear this week. heck...I'm lucky if I get my hair done each day. that were on the floor from the night before....maybe three days in a row! This foster care journey we are on definitely isn't an easy one. Not only have we fallen in love with the babies. But we love their parents. And I have told them that I love them. We are their biggest cheerleaders. We want for them to experience success. And they are so appreciative of us. It is so sweet of them. even she started to cry. I cry a lot when I am in their presence. I ache for their pain. I cried the whole way to the sheriff's department for my appointment. I cried for mom and dad. once filled with lots of little children. or didn't happen to have their children removed. They were still going to experience pain. Pain and heartache I can't even imagine. It was one of the first things we learned in our classes. But I didn't have to learn it there. It is what Jesus Christ himself taught while he was on this earth. In our classes we talked about not judging the parents. We don't know their history. We don't know how they were raised. Who taught them or didn't teach them. They need to be loved and respected. They are the parents and these are their children. and that is why the children were removed. They ask us if we hate the parents. We surprise them with our response. Because we love their children. that has surprised us the most. Our relationship with the parents. They don't feel threatened by us. and that is what Fostering Love is all about. This is so beautiful April...I would have never expected this kind of love for the parents but it makes total sense. What an amazing gift you are giving those children and their parents. omg April. Such beautiful words and your family is so amazing. Your journey has touched my heart. Thank you so much with sharing with us, you're teaching me so much about what it means to love. thank you so much. Beautiful. I think about this all the time and what a heart wrenching thing it must be to be involved in. As parents losing our children in any way is the worst pain we can imagine, I am so happy that this whole family is blessed with compassionate people to be a part of their difficult journey. Bless you all! So beautiful, really. What a wonderful experience. I see that I might sound like a broken record after the previous comments, but my first response to this was "beautiful". What beautiful words. What a beautiful expression of real love. Thank you for sharing your heart so openly. You are everything that is right in the world and I wish there was more of you! Thank you! So much love. I love that you feel this way towards them as you love their children. It really is a beautiful thing. I read your blog all the time but haven't commented in ages but I could NOT leave without saying how your post gave me goosebumps. You have a great way for putting your feelings into words and expressing how you feel. I know it fills your readers hearts! It does mine. Thanks so much! I really needed to read this...I am so far from where I need to be...we are foster parents to a little girl for 7 months now and we adore her...but I don't want to be friends with her parents and they want to....I'm praying that I will get closer to where you are...thanks for your words.